Sunblock and sweat run into my eyes as I trudge through a harsh, unearthly landscape. Ahead, the trail is fading away and a blast furnace sun beats down. A whisper of self-doubt tells me it’s just me and the desert now. I take a slow, deep breath and scan the horizon for San Bartolo, a once-thriving village that dissolved into rubble more than a century ago. When I started this trek, I had absolutely no idea what I was getting into. Aside from knowing that I was walking towards a hard-to-find ghost town and there was some water along the way, I knew little else. There really wasn’t any information I could find online — just the kind of adventure I was looking for. 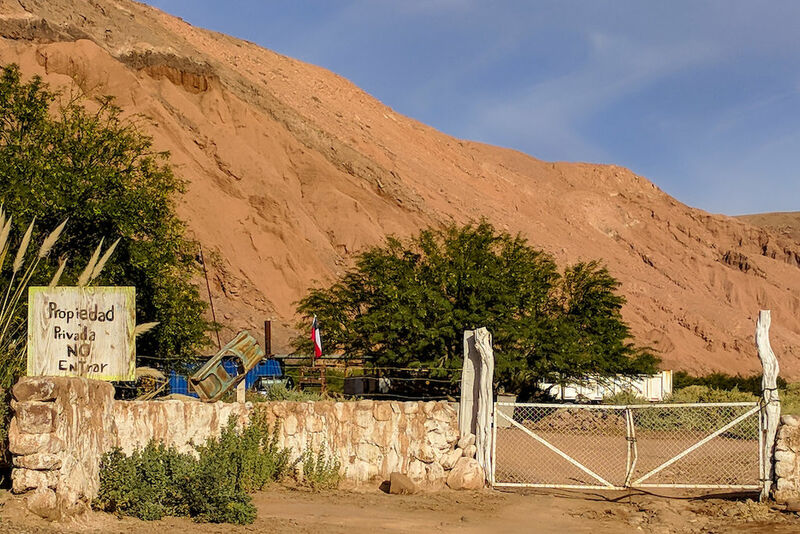 The route to San Bartolo starts at the village outskirts of San Pedro de Atacama, Chile. 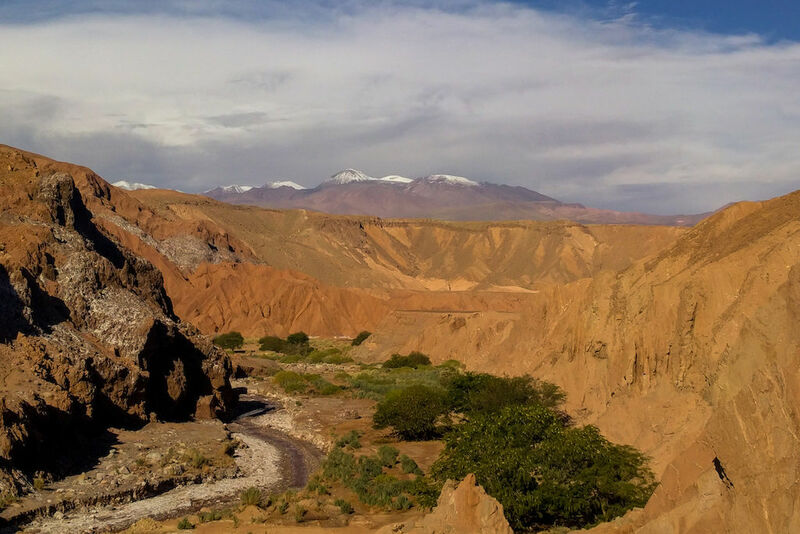 You’re in the middle of the Atacama Desert — the driest non-polar region in the world — and any trekkers here are in search of a beauty that’s more Martian than earthly. 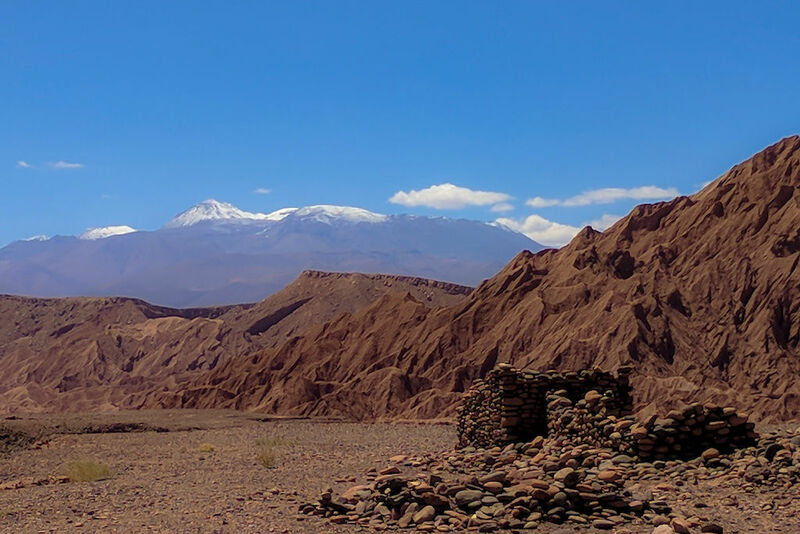 The hike is mostly flat, but the intense heat and sun of the Atacama Desert will present different challenges. The first half of the route follows a well-traveled road frequented by cars and mountain bikers. The trail will slowly disappear during the second half of the route and your unmarked walk into the heart of the high desert will truly begin. 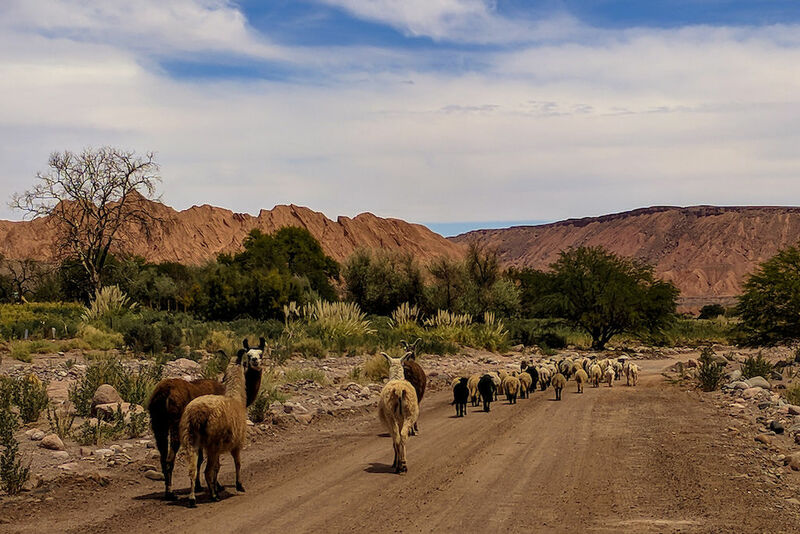 The route will offer gorgeous views of the Andes Mountains, ruins of a once-thriving civilization, a hundred-year-old church on a hilltop, winding canyon slogs upstream in the San Pedro River, packs of wandering farm animals, and plenty of alone time. I completed this trail alone and unguided from March 17th – 18th, 2018. 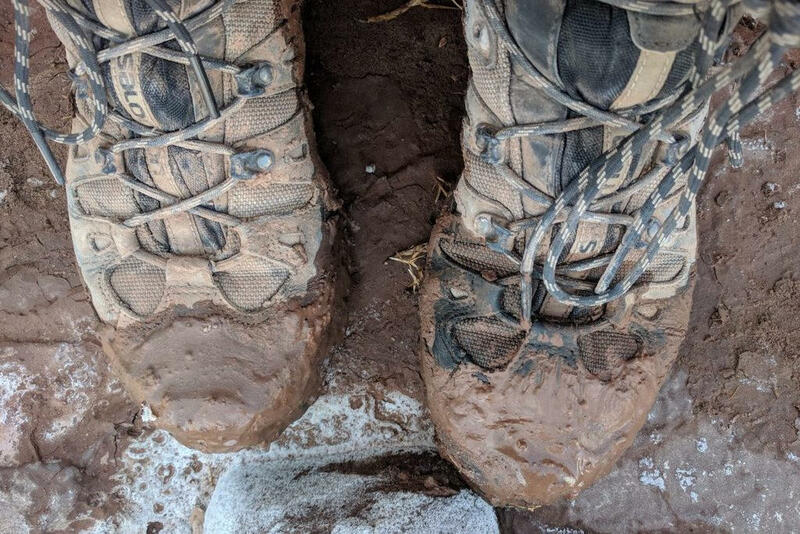 Hiking solo anywhere is a risky proposition and doing so on an unmarked route in the Atacama Desert takes experience and careful preparation. 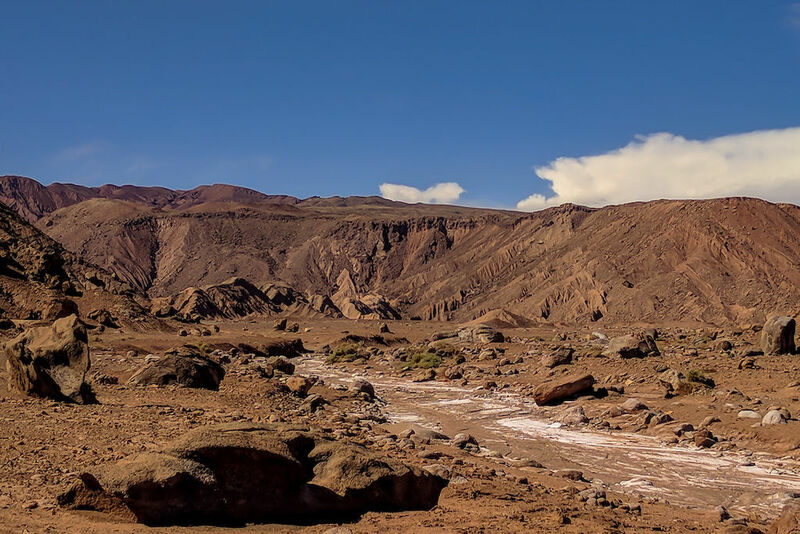 If you choose to hike alone, understand that the Atacama Desert is an unforgiving place with very few resources. Prepare thoroughly for the trip, stay hydrated, and stay on course. 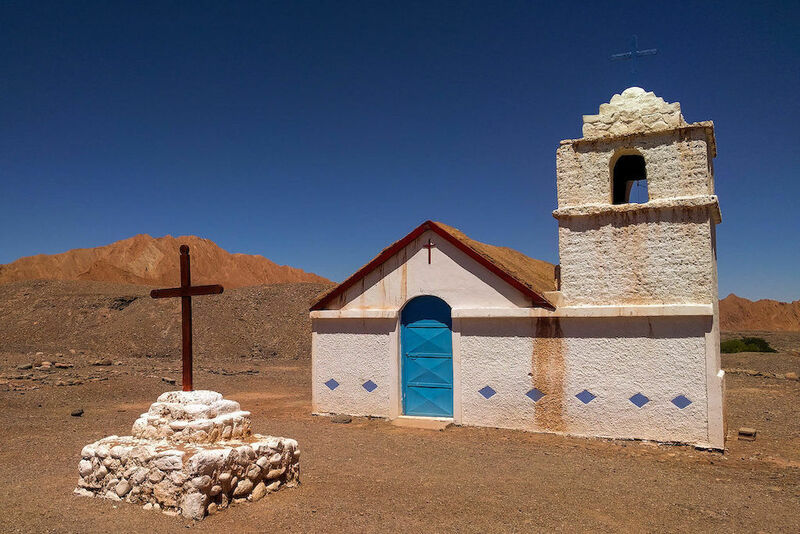 San Pedro de Atacama is a bit in the middle of nowhere but is easily accessible from many different directions. 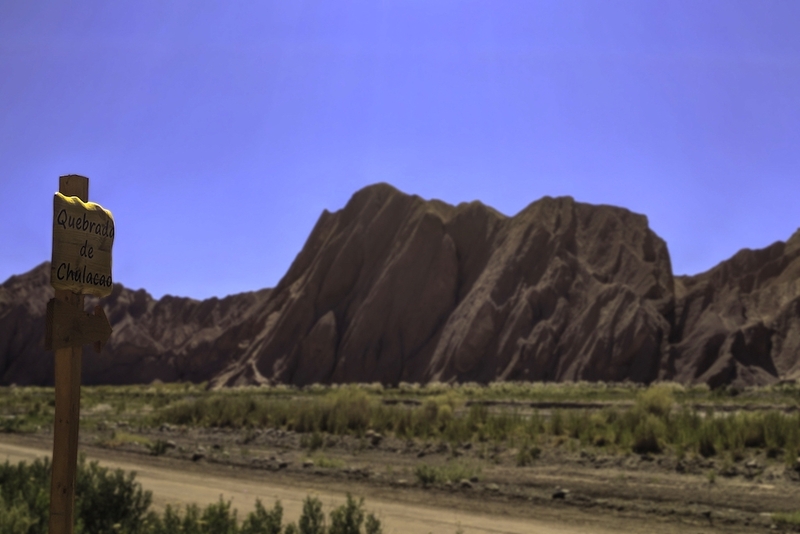 The closest major airport is located in Calama, Chile, which has numerous daily non-stop flights from Santiago. Long distance buses from Antofagasta, Arica, and Iquique will run straight to San Pedro as well. I recommend buying bus tickets on BusBud.com. 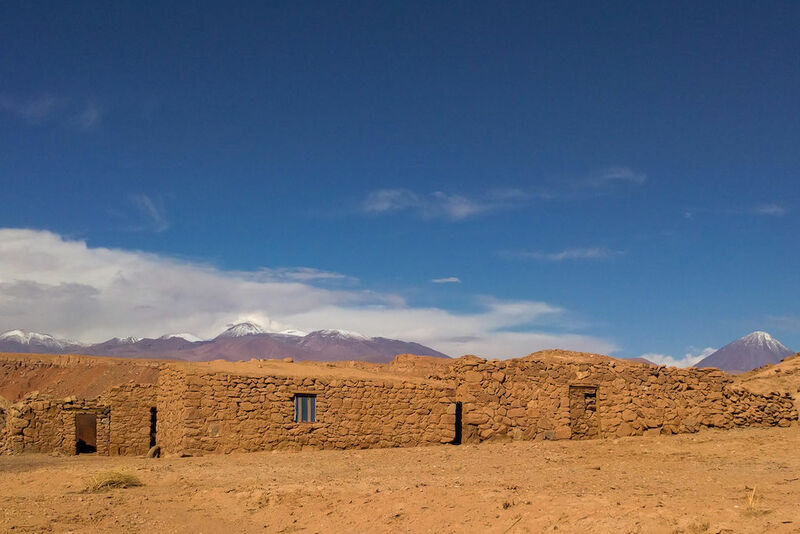 There are dozens of hotels, hostels, and campgrounds in San Pedro de Atacama, most of which are relatively expensive. To save money, I chose to stay at Camping Quilarcay. The campground was quiet, clean, and affordable. 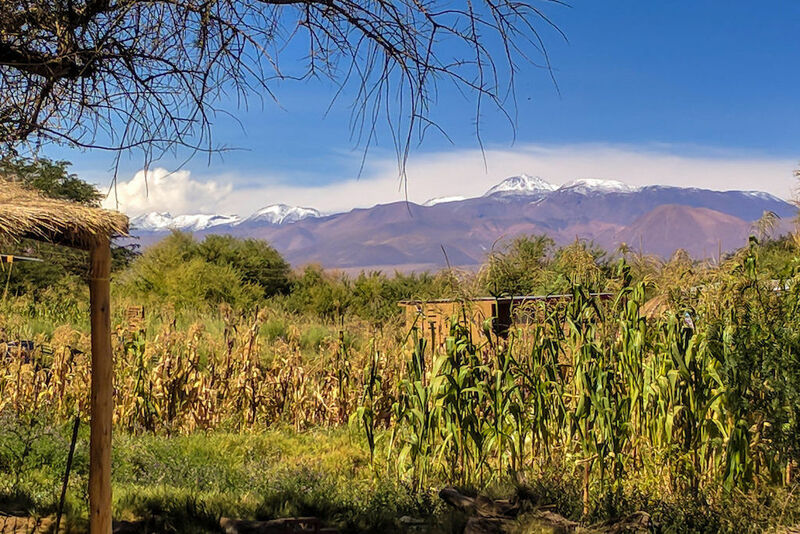 The atmosphere was calm and pleasant: friendly alpacas and sheep called to me from afar as the Andes towered in the distance. Although the campground does provide free water, I recommend bringing your own bottled water. Drinking the water provided by Quilarcay made me feel low-energy and out of it. Constant sun, relentless heat, steady wind, and a thin atmosphere. That about sums up summer in the Atacama Desert. 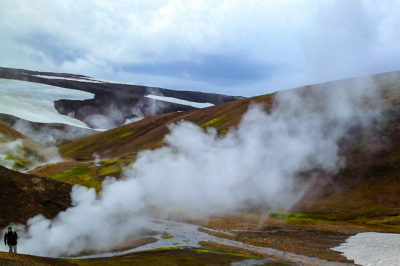 Winter months will offer lower temperatures and less sun per day, which should make hiking this route more enjoyable. Prepare accordingly. In my opinion, having a GPS map is mandatory if you are hiking to San Bartolo. The entire second half of the trek is completely unmarked, which makes using a GPS based app like Maps.me essential. Download the app and drop plentiful waypoints along the route. Important: The ‘San Bartolo’ destination on Maps.me is impossible to reach without crossing into private property! I spoke with the landowner myself and was not allowed to continue on. As always, bring an external battery bank along for the hike. This will save you a mess of trouble if your phone dies. Don’t start this hike without it. A wide-brimmed hat: The seemingly omnipresent sun will take no mercy. Shade that precious face of yours. My desert hat — Columbia Bora Bora Booney II Sun Hat. Heavy-duty sunscreen: Did I mention the sun is strong and ruthless and the atmosphere is thin? Ok, just checking. My sunscreen — Blue Lizard Australian Sunscreen SPF 30+. A water filter: Although the river water has been known to contain high levels of heavy metals (mining) and it is not recommended to drink, bring a filter in case of emergency. My filter —Sawyer Squeeze Filter. 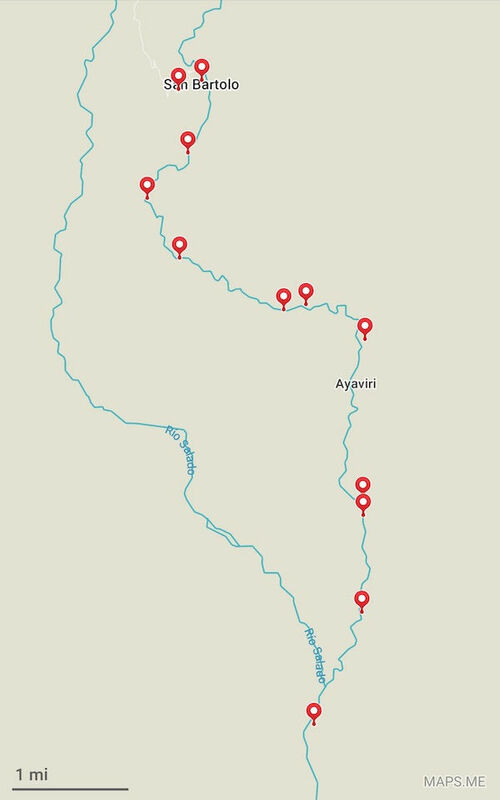 Water shoes/sandals: There will be numerous river crossings along the trek. I left my sandals behind and really regretted it. My boots got soaked and my feet blistered mightily. My sandals — Chaco Z1 Athletic Sandal. 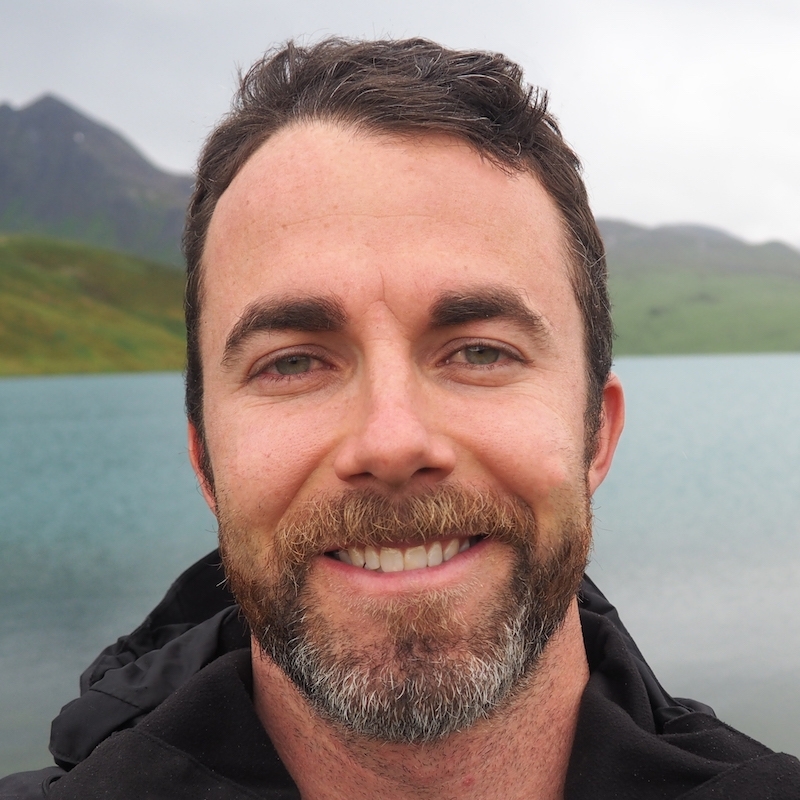 Here’s a list of what I bring on most of my multi-day treks. On this trip, however, I did not bring any rain gear, down jacket, gloves, thermal, long underwear, or balaclava on this trek. The chance of rain in the desert is extremely unlikely. The comfortable night-time temperatures allowed me to leave my cold-weather clothing at the Camping Quilarcay. You’ll need to pack all of your food because there is nowhere to resupply along the trail. I usually ration myself about 2700 calories a day and bring an extra day’s worth of food in case of emergency. We’re talking seven or eight liters. The dry climate, constant sun, and thin atmosphere will dehydrate you in a hurry. Yes, there is plenty of water along the way, but no, you should not drink any of it (even if you have a filter). Unfortunately, decades of unregulated mining have tainted the water in the San Pedro River. And always, pack out everything you pack in! 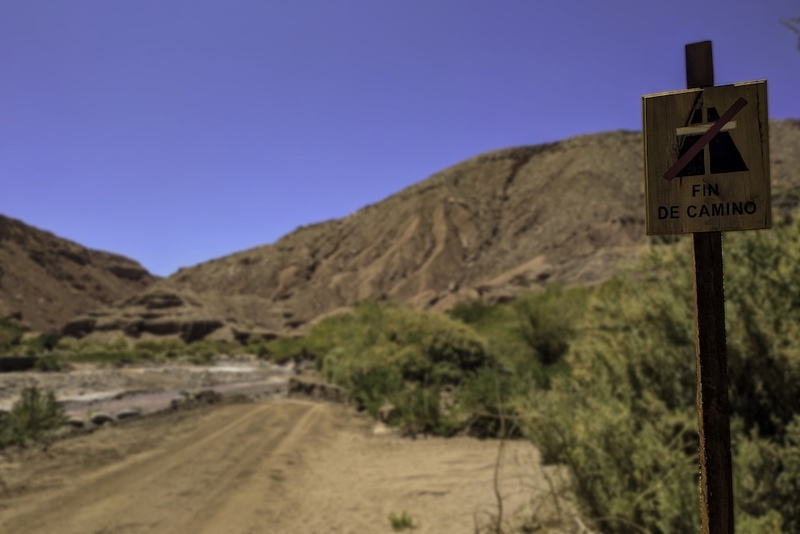 Many popular desert destinations near San Pedro de Atacama require a longish drive. Luckily, the San Bartolo trek requires a short car ride or an hour-long walk from town. I found a cab, showed them my map, and was at the trailhead ten minutes later. It’s also possible (and a lot faster) to get to San Bartolo via mountain bike, if you’re so inclined. Start the trek here. Just north of town. 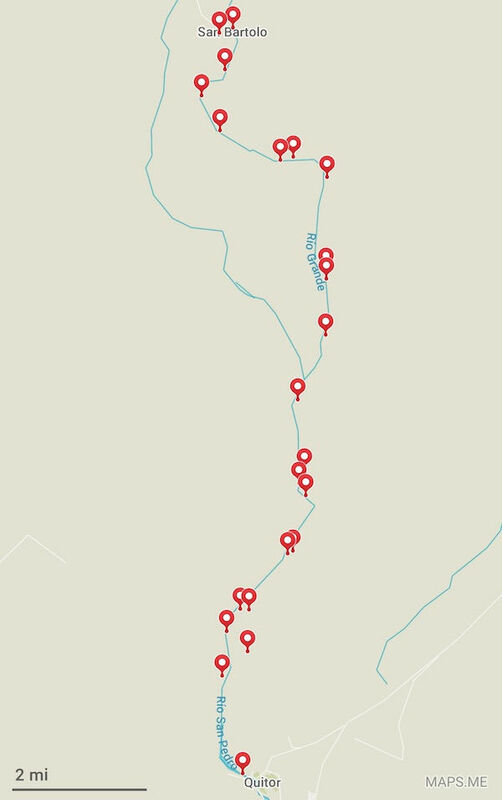 Maps.me will display trail routes from this location. You will start the trek near a parking lot just north of town near the San Pedro River. As you can see, there are trails that go in two different directions. The path to the south goes to some caves. I went to the entrance on accident and paid a small fee to get in. Oops. Cross the river and follow the trail north. You’ll come to a station where you can enter for a small fee (2,000 Chilean Pesos – about $3 USD). They’ll give you a brochure marking all the scenic viewpoints along the first four miles. Once you cross the boundaries shown in the brochure, the trail disappears and you’re on your own. The first part of the trail is a moderately busy dirt road, mostly car and mountain bike traffic. This is definitely worth the slight detour. 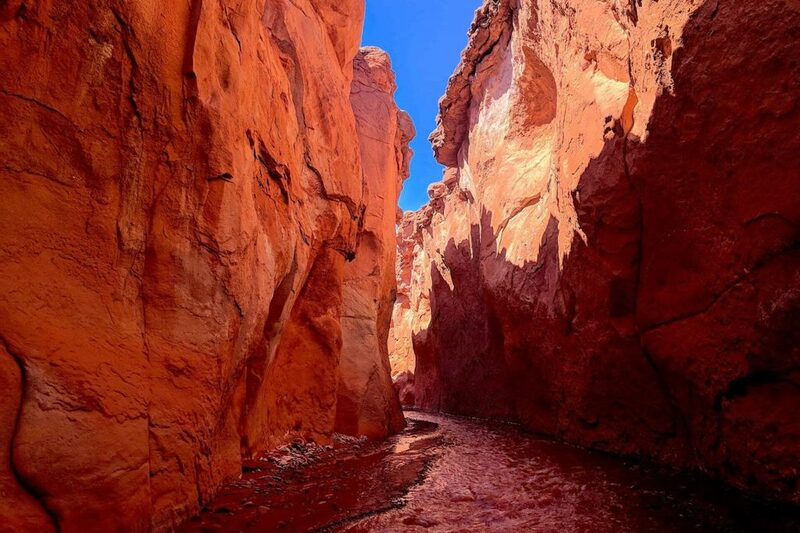 Quedabra de Chulacao is a gorgeous expanse of red rock canyon that winds for miles, carved by an ancient river. 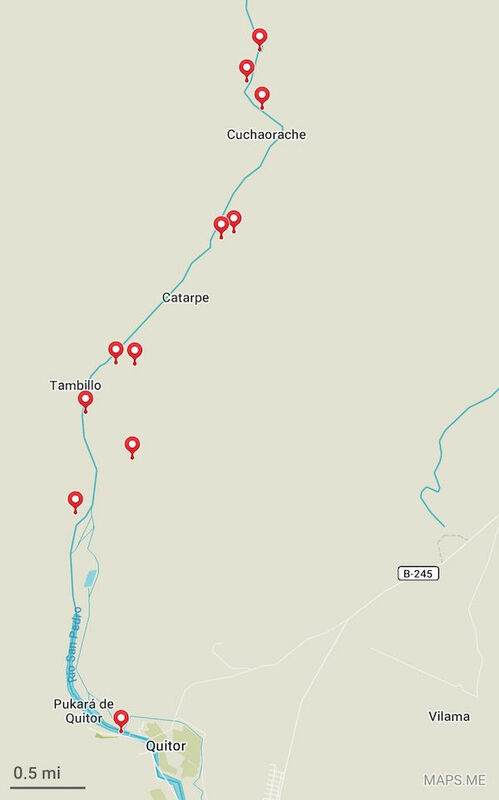 If you look closely at the Maps.me map you’ll see that it should be possible to follow the riverbed and reconnect with the trail much farther down, although this will add significant time to your trip, and you’ll also miss Tambo de Catarpe, which you definitely shouldn’t. Perched on high ground, this pre-Incan fortress (built in 1450!) was reconstructed in recent years. Jagged red walls of stone give way to impressive views of the Andes Mountain range and its numerous peaks of more than 20,000 feet in elevation. Beauty like this is well worth trekking across a desert! I’d heard that the San Isidro Chapel still conducts Sunday services. The tiny chapel, built in 1913, stands alone on a hilltop. The live service here is said to be a thing of pure beauty, but I missed it by a day. Maybe next time. Ok, I’ll admit it: I skipped this little side trip and wished I hadn’t. I passed it up because the harsh summer sun was beating down on me and I still had many miles ahead. The Cuchabrache Valley is known for several well-preserved archaeological sites that can be accessed with advance permission from the Catarpe community at the entrance gate. 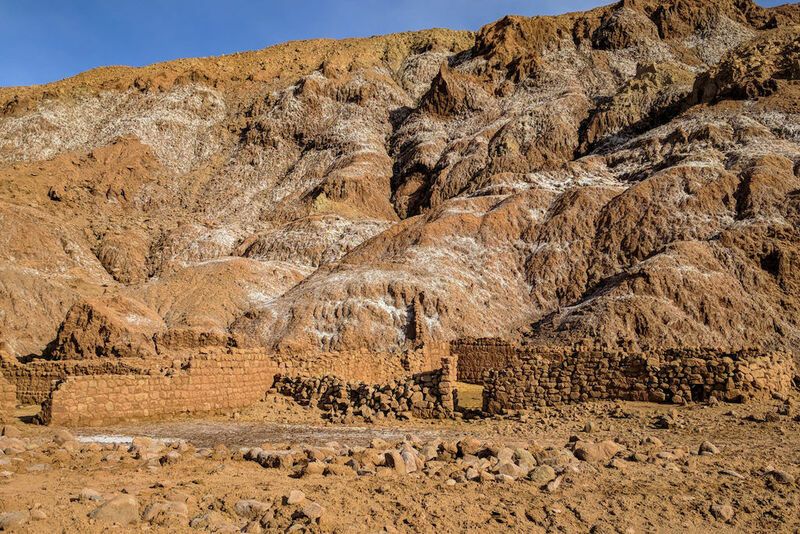 The lure is the prospect of more ruins and even some pre-Incan petroglyphs. End of the road? Yes. End of the adventure? Definitely not. It’s exhilarating hiking without a trail, and that’s why I loved the second half of this hike so much. Once this road ends, so does the trail. You’ll encounter intermittent rural roads and paths, but mostly you’re the navigator charting your own route. Remember: you may not see another human being (I didn’t) for the complete second half of the day. Use common sense, follow your map, and drink lots of water (just not from the river). You’ll soon be crossing many rivers, so wear your water shoes/sandals or risk getting blisters all over your feet, as I did. The route to San Bartolo will mostly follow the San Pedro river upstream. Carve out your own path, but also keep an occasional eye on Maps.me, to avoid the kind of surprises you really don’t want. Soon, you’ll have no choice but to walk in the river as the red cliff walls draw tighter around you. It’s a once-in-a-lifetime experience walking alone upstream in a canyon in the middle of the world’s driest desert towards a ghost town, across a landscape like Mars. I highly recommend it. The water level never got up past my knees, but I imagine levels could start to get uncomfortable on the warmth of early springtime. Thankfully, I found the Rio San Pedro is more of a creek than it is a river. At the end of the canyon, the route breaks away from the river and takes you into an otherworldly valley for the next mile. It’s important to pay close attention to your surroundings as you’ll no longer have the river to follow as a guide. Let Maps.me lead the way through the valley and you’ll be fine. 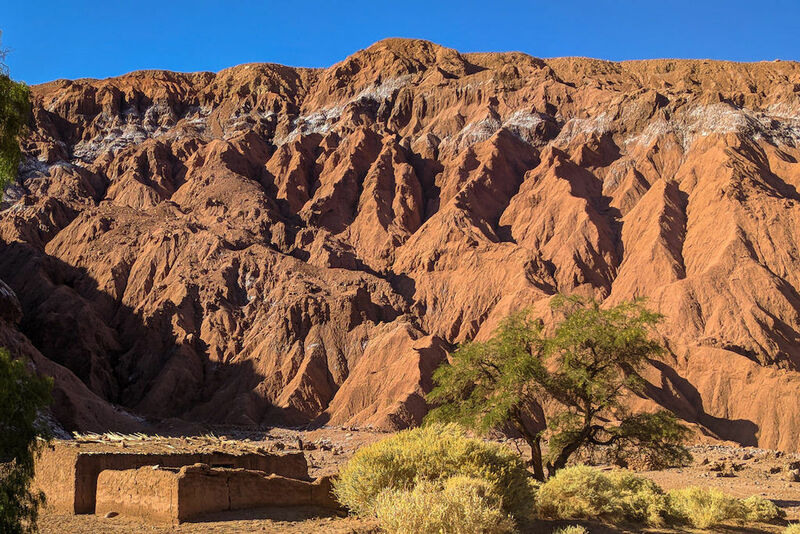 As the sun continued to beat down and my stamina started to fade, I began to feel the Atacama Desert’s intense, raw beauty, unlike anything I’d ever experienced. I was dehydrated, achy, and in total awe. Remind me — what planet am I on? 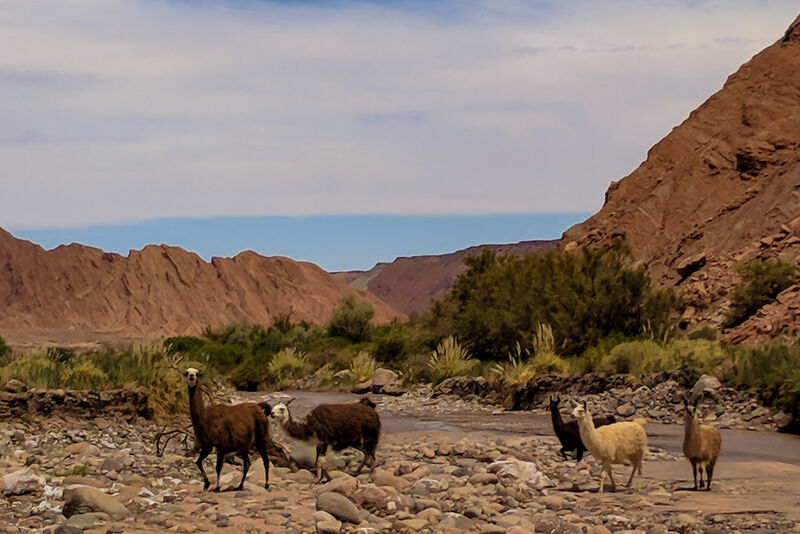 I was lucky enough on my trek to cross paths with some unusual animals as I got closer to San Bartolo. First, I came across a pack of seven or eight gigantic pigs that were incredibly territorial. I tried to get within range to snap a picture, but they got more than a bit annoyed with my presence and grunted loudly as they approached me with gleaming, territorial eyes. Well, that was a bad idea. I left in a hurry. Next, I encountered a few donkeys that were equally unenthusiastic about my presence. They ‘hee-hawed’ at me from a distance as I tried again to get close enough for a picture. Their shrill calls broke the silence in the valley. I quickly decided it also wasn’t a good idea to chase donkeys around the desert. I suspected the donkeys and pigs belonged to a nearby family farm. There are only a few small houses scattered along the route to San Bartolo. What a hard life it must be living in the middle of the desert, with no neighbors in sight. During the last few miles of the trek – before you reach the point of no return – you will come across the plentiful ruins of San Bartolo. For the most part they are easy to spot, but keep your eyes open for more discrete structures along the way. The land was of San Bartolo was inhabited and abandoned twice in the last 500 years. First, indigenous copper miners in the mid-16th century fled their thriving village when Conquistadores showed up to do their thing. Funny how that happens. San Bartolo was again inhabited in the middle of the 19th century by Chilean miners. 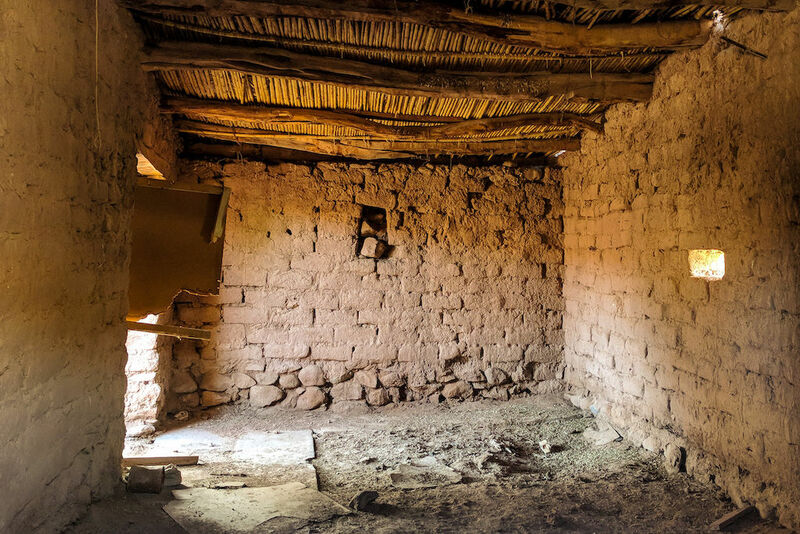 Armed with better technology than the past, they build another successful community with offices, shops, and trade routes to neighboring villages. However, war, competition, floods and other factors led to a second abandonment of the community. The people left their tools to rust in the desert sun and wandered off towards new possibilities. The various buildings have been reconstructed by the surrounding community. For what reason? I still can’t figure that one out. There is very little tourism that comes and goes the direction of San Bartolo. 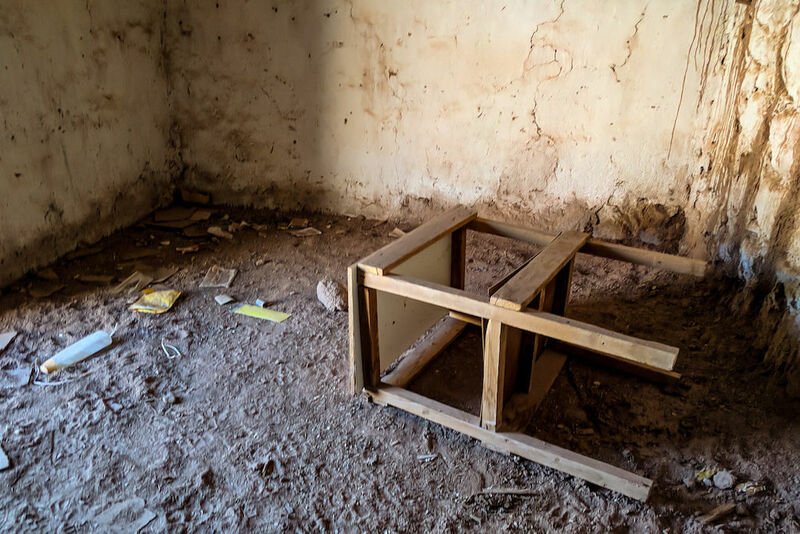 As I wandered around the silent structures in amazement, I saw desks, chairs, and trash left behind by squatters who found refuge in the structures over a hundred years after they had been abandoned. The cycle continues. According to my Maps.me, San Bartolo was still a mile or two beyond the ruins pictured above. 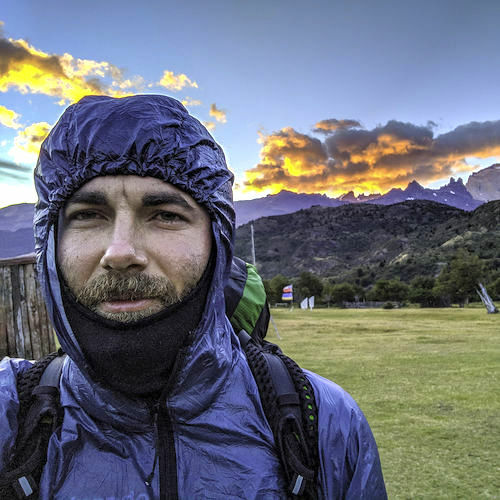 I was dead set to camp there for night one (and actually continue walking to the more well-known Valle de Arcoiris on day two). Alas, my plans did not come to pass. There’s no way around this, folks. Believe me, I explored all the known options. I sneakily followed the river onto private property for a few minutes, then became flustered and retreated when I heard voices in the distance. I scrambled up a sizable steep ridge of loose dirt to get a better view of the surroundings. There was no obvious way to continue my trek without crossing private property. I toyed with the idea of stealth trespassing but then decided that was a terrible idea. And I’m sure it would’ve been. Instead, I found a beautiful elevated spot for my tent, just a few hundred yards from the property line. Dehydrated and running low on energy from the iffy water from Camping Quilarcay, I was so glad to call it a day. As I lay in my tent, I decided to talk to someone from the property the next day. I wanted answers. I rose early the next day and poked around the gate, looking for anyone to talk to. The property beyond the gate lay silent for a half-hour. The thought of crossing onto the private property slipped into my conscience again, but common sense once more prevailed. I flagged the truck down and spoke to the owner as his daughters watched me with dark, curious eyes from the back seat. The driver turned out to be the owner of the property beyond the gate. And with those few words, my wishful thinking ended. Well, at least I had some closure. I explored the ruins once last time on the way out and started the long journey back. The sun was already roasting, and I wasn’t feeling any better from the night before. Looking back, it was a blessing that I couldn’t continue. Soaking wet feet in the driest desert in the world. Isn’t that a bit ironic? I retraced my steps back through the San Pedro River, this time with much less enthusiasm. The desert was beating me up. My new plan: start hitchhiking back as soon as I find a traveled road. I came across six aloof alpacas on the way back. I followed them for a few miles, back towards the town. They were wary of me, but ultimately let me get very close. Then, a few dozen sheep joined us. They trudged ahead of me, and I followed. Someone told me later the sheep probably thought I was their shepherd. Maybe I was. The alpacas and sheep were a bit of a morale boost as I worked my way back towards town in the midday sun. As quickly as they came, they cut left towards a farm and vanished in a cloud of dust. It was fun while it lasted. About an hour after I reached the main road, I was picked up by a nice couple: a shaggy-haired man from Germany and a smiling and talkative Chilean woman. 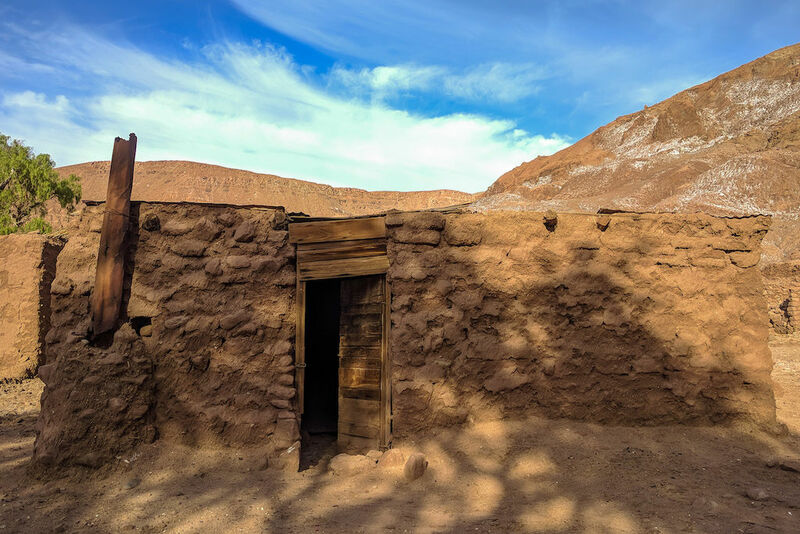 The man had taught English in San Pedro de Atacama years before. He was back from Europe on vacation to reunite with old friends and explore what he hadn’t yet seen. As he drove us back towards town, we jokingly cursed the endless desert. He laughed at his decision to actually move here years earlier. Yet he had returned to visit. From halfway across the world. And I have a feeling I’ll be back one day as well, wandering the vast desert, hypnotized by the torturous beauty of it all.